Spring Training is just around the corner and baseball players all over the country will be gathering to train until their arms are sore and knees are weak to be in the best shape for the upcoming season. Our POWERHANDZ Pure Grip Baseball Gloves will elevate your training to the highest level and ensure that you are able to dominate every game. We have poured our heart and soul into our products along with the latest scientific innovations to create the ultimate baseball training product. Let our gear propel you to becoming the MVP of your team. When you step up to take a swing, you need to have complete control over the bat. Too little results in you swing randomly and wildly hoping to make contact with the ball. You aren’t swinging a fan to cool the other team off, you are swinging a bat with pin-point accuracy. Having incredible control over how you move the bat is key to being a successful player. Our gloves have been specially designed to help you improve this skill. After just a few training days wearing them, the bat will become an extension of your arms. Baseball is all about the hands. Catching, throwing, hitting, everything comes from the hands. Every player needs to make sure that their wrists and fingers are as strong as possible. Our gloves are built with extra weight, meaning that all your training becomes that much harder. How can you get a killer hit on a ball to ensure you get to 2nd base? Making sure you can get more momentum with your swings. The faster your bat is going, the more power it will have. What does more power mean in a swing? You can hit the ball farther. One amazing hit can change the course of a game. Our weighted gloves help increase your swing speed by helping you build muscle in your wrists. More strength means faster bat speed and all that extra speed means more power out of each hit. When you are up to bat with the bases loaded, the only thing that you can rely on is your training. Have you worked hard enough to ensure that you don’t crash and burn your team’s hopes of a championship? When you train with the baseball gloves you know that you have. We challenge everyone to spend their spring training with our Pure Grip Baseball Gloves. Baseball training is here and you are going to kill it. Our gloves will allow you to become the GOAT for your team. Your bat speed will go through the roof when you train with us and that means you will be able to overcome any team you go up against. 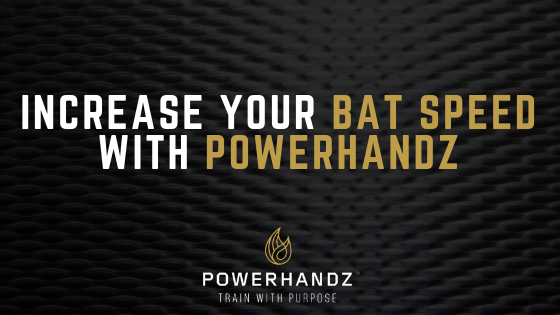 To learn more about POWERHANDZ and how to become a champion, read our blog!